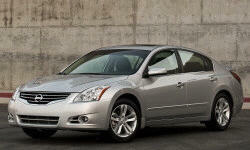 Why the 2010 Nissan Altima? I bought the 2010 Altima for the reliability and durability that Nissan's have been known for. Their styling is a notch better than Honda or Toyota. I have been driving the Altima for nearly 2 months now. I bought a pre-owned model for reduced depreciation. I drive my personal car for work purposes so this is why I went pre-owned (re-imbursed 0.42/mi). So far so good. I am averaging 30.2 mpg (city/highway). I am very satisfied with the economy. The 2.5L engine has performed well. The car was a lease return and was driven 9k miles/yr prior to my ownership. I hope to put 200k miles on this car before changing again. I have heard of the CVT having issues. Keeping my fingers crossed and will make sure to keep it maintained. Nissan raised the warranty on the CVT to 10/yr/120k miles. I recently replaced the tires (Michelins Primacy) which had 30k miles. I was hesitant to do so because the tread was almost to the wear bars at 30k mi. These are the original new car tires. The reason I went with the original tire again was because I wanted to keep my fuel economy where it was. If I upsized, the economy would have been affected. These tires are designed to have less rolling resistance but I only wish the tread life were better. The dry/wet traction is good and they are quiet. Tread life is my only complaint. I choose the Atima because it's styled better than the Honda Accord or Toyota Camry. I get compliments on how it looks (no aftermarket parts have been added other than window tinting and sunroof vent). I am a big guy who at first did not consider Altima because I did not think I would fit in it. I was surprised to find I fit just fine. I am 6'3" and 252lbs. The front seats provide ample room. I also have a lot of head room. My 2010 Altima 2.5 SL Sedan has the BOSE audio with back-up camera. The back up camera works well. First vehicle I've owned with one and still getting use to it. It has come in handy when backing out of tight city-parking spaces. The BOSE stereo sounds very good. However, the headliner vibrates/rattles if volume is mid-level or higher. The bass notes of the music causes the headliner to vibrate/rattle. I first thoght the speaker was blown, but not the case. The headliner needs more insulation to prevent this. Otherwise, the BOSE system in the Altima is great sounding. Just need to add insulation to prevent the vibration/rattling when the bass notes occur when volume is mid-high level. Why Not the 2010 Nissan Altima? The headliner vibrates and rattles when the BOSE sound system is at mid-high volume level. Not enough ant-vibration/insulation in the headliner. I am worried that the CVT transmission will not hold up. 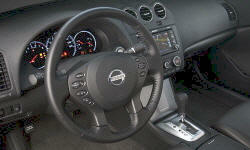 Nissan has extended the warranty on the CVT to 10 years/120k miles. I want to drive this car 200k miles without requiring major repairs.